The U.S. Environmental Protection Agency launched an initiative to promote expeditious remediation and revitalization of Superfund sites. The goal of the initiative is to dramatically improve the progress of cleanups across the country by incentivizing stakeholders, encouraging private investment in cleanups, and applying best practices that lead to full beneficial use of properties across the country. A Superfund Task Force established by the U.S. EPA Administrator published a set of recommendations on July 25, 2017 to meet this goal. 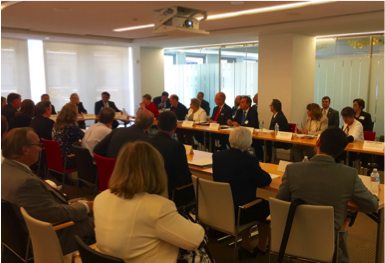 To foster a timely response to this initiative, on August 10, 2017, THG in partnership with HSW Engineering convened the Superfund Initiative Roundtable with federal and state agencies, private and public responsible parties, and nongovernmental organizations. The Roundtable provided an opportunity to exchange ideas and discuss creative, workable solutions to mitigate administrative, technical, and financial barriers to completing environmental cleanups and returning properties to productive use. A summary report of the discussion will be available in the coming weeks on the THG Roundtable webpage. To download the Roundtable resources, click here.